I have had this medal for a decade. 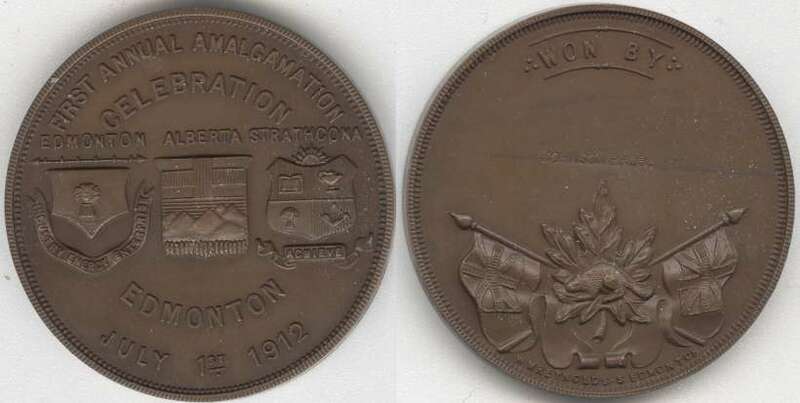 After some contact with several librarians in Edmonton, I found out that in 1912 there was an Amalgamation day to celebrate the linking of Edmonton and Strathcona. Various athletic contests were held and this was one of the medals to the winners. They sent me newspaper articles from the time that described the event. They didn't have on in their collection so I have no idea on its rarity. I have the same medal. Mine is a gold-plated example that is named - "C D Roberts / Throwing Hammer Sr". I have had the medal for more than 15 years. It comes from my late father's collection. I have no idea where he obtained it or how long he had it. I brought it to the Edmonton Coin show in November 2008. No one in the room recognized it. Well, we know that there are at least 2 of the original 30 minted that survived. I got it in a very large consignment 11 years ago. Original collector collected all things numismatic but no idea how/where this one came from. Too bad there were not 200 winners so it would be collectible and have value more than as a historical oddity.